I pour out my complaint before Him; I declare before Him my trouble. The betrothal process, thus, was partly an assurance to the groom that he would not find himself responsible for another man's child. But poor Joseph. He was obviously fond of his bride-to-be and had not slept with her, when suddenly he faced the prospective groom's worst nightmare: his fiancee was pregnant, but not by him. But what a man Joseph proved to be; he loved Mary so much, that instead of breaking the engagement (which was the main purpose of the betrothal), he hid her from sight, so that she would not suffer the disgrace of her condition. The verse is not clear whether he still planned to marry her; possibly, the words "put her away" imply that he would break the betrothal, possibly not. Deuteronomy 24 does not require that divorce be public. So why was Joseph so willing to trust a dream he had? Matthew says, "All this was done that it might be fulfilled which was spoken by the Lord through the prophet." This rang a bell with Joseph; every Hebrew knew the words of the great prophets Isaiah and Micah, and knew that the redeemer would be born to a virgin. 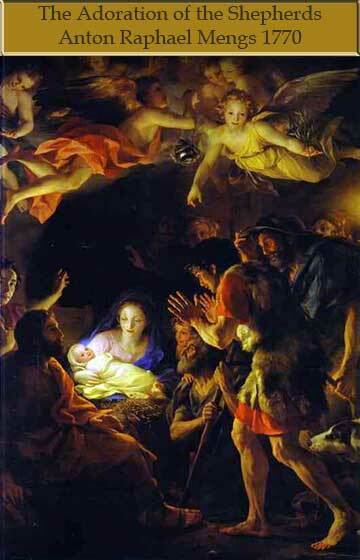 So he was faced with the rather mind-boggling possibility that he would be the stepfather of God made flesh. Joseph was clearly a righteous man, because not only did he take Mary as his wife, but he allowed her to remain a virgin until after Jesus was born. It is a bit heartwarming to think of this young man woman thrust into these extraordinary circumstances; and on this day, we especially remember Mary, who gave birth to her first child, the child of God, lying on a pile of straw in a smelly stable. We are reminded of the humility of Christ's birth, by being told that his first bed was a feed bin. The human side of Christ was an object lesson to all who would come to believe in him; the humility he preached was a humilty he had lived.